Virginia Ann Bristow, 81, passed away Sunday, August 6th, 2017. She was born December 25th, 1935 in Mattapan, Massachusetts. She attended the Allen Chapel Freewill Baptist Church of Southside. She enjoyed square dancing and traveling. She was crowned winner of Miss Senior Independence County in 2009. 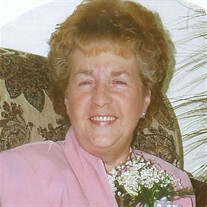 She enjoyed cross stitching and made quilts for her children and grandchildren. She was preceded in death by her grandparents; her parents, Helen and Thomas Murphy; her husband, Charles Bristow Sr; and multiple cousins, aunts, and uncles. She is survived by two sons, Charles Bristow Jr and his wife Connie of Batesville, and Timothy Bristow of Batesville; three daughters, Katherine Ann Bristow Stobaugh and her husband Danny of Batesville, Sandra Lee Bristow of Floral, and Susan Marie Bristow Fleischer of Glendale, California; one sister, Kathleen Tenore and her husband Frank of Bridgewater, Massachusetts; fifteen grandchildren; twenty great grandchildren; one great-great grandchild; and a host of other relatives, church family, and friends. Visitation will be Friday, August 11th from 1-2 PM with the funeral service beginning at 2 PM at the Willis Funeral Service Chapel with Bro. Tim Landers officiating. Burial will follow at the Egner Cemetery of Salado. Pallbearers will be Jody Tosh, Randy Ishikawa, Bobby Bristow, Michael Bristow, Andy Ishikawa, Jared Schales, and Marcus Bristow. Honorary Pallbearers include Jason Tosh and Matthew Bristow.